Cuffnells, or Cuffnalls as the name has alternatively been spelt, was for many years an extensive country estate of 160 acres on the outskirts of Lyndhurst. But the mansion house was demolished in the mid-20th century, and is recalled now by an 18th century lodge and driveway on the A35 Christchurch road; by Cuffnell’s Farm; and by the late-19th century Cuffnell Cottage close to the turning for Bank on the A35. Bocus de Cuffenore - considered to be an earlier form of the name - was mentioned way back in 1375 when it was thought to refer to Cuffa’s bank or slope. Isaac Taylor on a 1759 map of the New Forest showed Cuffnells and a symbol denoting a large house, whilst Richardson, King and Driver in the late 18th century provided considerable detail of the estate boundaries, the location of the house and the layout of associated buildings. 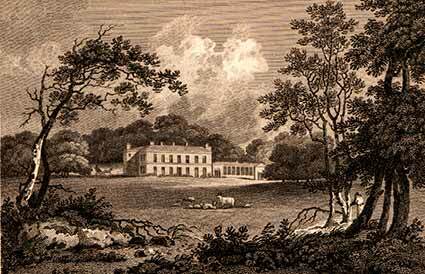 As with many country estates, Cuffnells changed hands relatively frequently. In 1741, the year of construction of the Lyndhurst parish church that preceded the present building, church seating arrangements show ‘Mr. South of Cuffnells’. By 1783, the Rate Books show Sir Thomas Tancred, Bart, whose interests extended considerably beyond the New Forest – he was also Provincial Grand Master of the Masonic Province of Yorkshire, West Riding, between 1771 and 1779. After Sir Thomas’ death in 1784, the estate was purchased by George Rose, who is shown as the owner on the Richardson, King and Driver map. Born at Brechin, Scotland, on June 11, 1744, Rose was the son of a poor clergyman. After a career in the Navy, talents as an administrator took Rose into public service where he became Joint-secretary to the Treasury and eventually President of the Board of Trade. Rose was closely associated with William Pitt (the Younger), and was visited at Cuffnells by both the Prime Minister and King George III. Remarkably, Rose also found time to be a New Forest Verderer, and MP for Lymington and Christchurch. He was also the owner of a racing bull that turned out at Lyndhurst Race Ground where, from all accounts, it performed admirably. William Cobbett, though, writing in Rural Rides, was not quite so generous when referring to George Rose. Eight years after Rose’s death, on a visit to Lyndhurst in October 1826, Cobbett remarks: ‘I am here close by the Old Purser’s son, George Rose’s! (The exclamation mark is Cobbett’s). And so, singled out as the subject of some controversy, at least in the eyes of the incorrigible Cobbett, Cuffnells moved sedately through the early years of the 19th century.